Recently I've been trying a new, more natural mouthwash. The Natural Dentist Healthy Gums Anti-Gingivitis Rinse is proven to help reduce and prevent bleeding gums and protect against gingivitis. It doesn't contain alcohol or artificial ingredients, which makes it a much healthier choice for a mouthwash. Logically, we know that alcohol isn't the most healthy thing for our bodies, so why would it be so great in our mouths? The Natural Dentist has also been tested in controlled studies on human volunteers, and personally I felt secure in trying it. I've been fortunate in that I haven't had a lot of trouble from my teeth, but I do want to make sure this trend continues. The peppermint twist flavor has a minty/lemony/herbally taste to it. It contains aloe vera as its active ingredient, which is proven to help prevent bleeding gums. If your gums are bleeding, it's a warning sign for gingivitis, and time to take action by seeing a dentist and doing what you can to prevent progression. The Natural Dentist line also includes other natural components such as echinacea, goldenseal, calendule and grapefruit seed extract to calm any inflammation. You can also find The Natural Dentist on Facebook. They have been generous enough to offer a bottle of the Peppermint Twist flavor to one reader! Click on 'read more' under my signature to enter. Good luck! 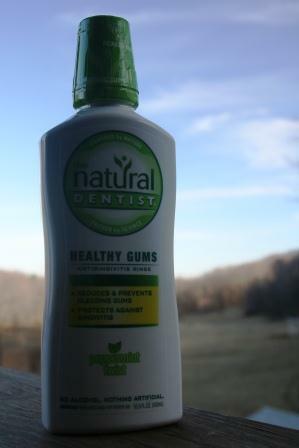 Disclaimer: I received a bottle of The Natural Dentist Healthy Gums Mouth Rinse for review purposes. The opinions written above are my own. oops! I would pick spearmint! Count me in! :) Great giveaway - it's awesomesauce! Lol. This really sounds like a great product. Wonderful review! I like the Natural Dentist mouthwash I have.... It has grapefruit seed extract in it which is so healing. Another great giveaway and product Lisa! This does sound like a great product! Thanks for sharing this review! It sounds wonderful but I don't do Facebook. I'm sure I'd be addicted and can spare no more time. Guess I'll have to try this great soundin' product the old fashion way. $$$$$....Heeehehehee! Haven't seen this one. Would love to try it! I would say lemon, it is one of my favorites! FB isn't someplace I visit often but think the mouthwash sounds delightful. Is the lemon very strong; is it puckery? I need to look into these products for my office. Thank you for the wonderful review! Thank for mentioning this product. I have never head of it, but as someone who has had already had four gum grafts I will definitely give it a try. We need to take care of our teeth! Tangerine or Raspberry would be my flavor of choice. Too bad no one makes mouthwash in those flavors. That Peppermint Twist sounds nice! i would definetly choose peppermint.. I like a spearmint mouth wash!